FREE Giveaway: Get one of 100 Copies of ’31 Days to Build a Better Relationship’! 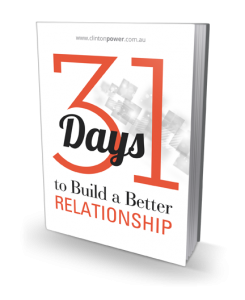 I'm very excited to announce that I've just launched my new eBook called 31 Days to Build a Better Relationship on Amazon!This eBook has been the culmination of over a decade of working with a wide range of relationship issues, and my perpetual interest in what makes a great relationship. I wanted to write a book where the reader could read a … [Read more...] about FREE Giveaway: Get one of 100 Copies of ’31 Days to Build a Better Relationship’!